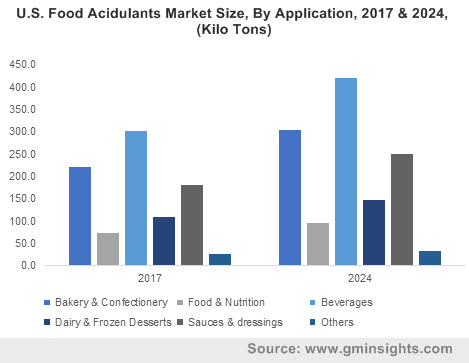 Food Additives Market size was over USD 55 billion in 2017 and industry expects consumption above 385 million tons by 2024. Rising consumer awareness regarding health consciousness along with favourable government initiatives has led to extensive usage of food additives in the market. Changing lifestyle and the consumer tendency towards shifting with convenient, processed and packaged products may stimulate market size. They are added in small quantities in various products for improving and maintaining its freshness along with enhancing its flavour, taste, aroma, texture and appearance. Increase in women workforce and changing lifestyle patterns of consumers has initiated the high consumption of processed products thereby stimulating the food additives market size. Global processed foods market size was valued at over USD 2 trillion in 2016 and is expected to witness significant gains in the foreseeable timeframe owing to rapid urbanization and population growth. Moreover, increasing difficulty in the supply chain owing to rise in logistics cost is likely to promoting the adoption of these materials to minimize the wastage and spoilage costs, thereby stimulating the global food additives market size. Rapid expansion of technology in the industry pertaining to consumer’s demand for healthy and organic food options will positively affect market growth. Asia Pacific food & beverage market was valued at over USD 3.0 trillion in 2016 and may witness gains at over 10%. Food additives derived from natural sources are easily available at minimal cost, which is providing a cost advantage to the manufacturers. Further, these products require less processing as compared to the artificial sources and provides nutritional benefits. Over 15% of bakery and 23% of dairy & confectionery are used as packaged products in APAC. Increasing consumer awareness regarding the beneficial usage of food additives mainly in bakery and confectionery, dairy and meat products is expected to highly foster the market growth. Raw materials used in the production process are derived from either natural source such as plants or chemically produced to prevent contamination and preservation. Key raw materials used in the production includes soybean, sunflower, rapeseed, palm oil, glycerol and sugarcane. However, fluctuating raw material prices may hamper the market growth. Companies are largely engaged in collaborations and joint ventures to cater to high demand from the food and beverage industries. Flavors & enhancers market may witness a significant gain at over 5.5% over the forecast timeframe. It plays a vital role in the consumption & acceptance of quality in everyday life, thereby driving the industry growth. Natural flavor market size accounted at over USD 8 billion in 2017, which is predicted to grow with a rapid pace over forecast period owing to increasing use of enzymes to extract flavor compounds from natural sources to meet product demand. Sweeteners market size is projected to surpass over USD 60 billion by 2024. Consumers believe in low-calorie sweeteners will effective for various purposes which includes weight reduction, weight maintenance, management of diabetes and reduction in the risks associated with obesity, thereby driving the industry growth. Asia Pacific natural sweetener market size is likely to witness a significant gain at over 4.5% during the forecast timeframe. Natural sweetener increases the stability and is used in milk to enhance the content of bioactive calcium. Food emulsifiers market size may witness a significant gain at over 4% during forecast timeline. They are widely used to aid various processed products and also to maintain freshness and quality. Lecithin market is projected to reach at over USD 530 million by 2024. Lecithin is generally used in bakery, confectionery and beverage industry owing to significant characteristics that it is smoothening the textures, for dissolving powders, to repel the sticky material, for homogenizing mixtures in liquid and also it is used as an emulsifier and stabilizing agent. Hydrocolloids market size is projected to surpass over USD 8.5 billion by 2024. They are added in order to control their functional properties, such as thickening or gelling. As a thickening agent, they find uses in gravies, soups, salad dressings, and sauces while as gelling agents, they are extensively used in products like jelly, jam, marmalade and low sugar or calorie gels, thereby propelling the industry growth. Food additives market size from bakery & confectionery application is projected to reach over USD 35 billion by 2024. They are widely used in various bakery & confectionary applications which includes cakes, biscuits & cookies, chocolates, sandwiches and breads. Flavors enhance the volume and texture of baked goods. Food additives market size from nutrition application is likely to gain over 3.5% during the forecast timeframe. They are widely used in various products to improve the overall nutrient value. Natural flavor products are used in the milk to increases the bioactive calcium in the milk. It is the recent development in the category of natural flavor enhancers. North America led by the U.S., Mexico and Canada food additives market size is expected to reach at USD 28 billion by 2024. The growing demand for confectionery and beverage products in North America due to hectic lifestyle, increased urbanization and growing retail and hospitality sector is in turn expected to drive demand. Growing consumer awareness on natural and functional food additives due to their nutritional functionalities is also driving the market in the region. Europe led by Germany and UK, Russia, and France food additives market size is expected to reach at USD 25 billion by 2024. Growing demand for convenience and organic products in Europe is expected to fuel demand. Increasing awareness about diseases that can be kept at bay by effective use of additives and increasing health consciousness among the general populace in Europe is expected to boost growth of the market. Asia Pacific led by China, South Korea, India and Japan food additives market size is expected to reach at USD 40 billion by 2024. Rising awareness about high nutritional diet and increasing need to impart ethnic taste are playing a key role in accelerating demand in Asia Pacific food additive market. 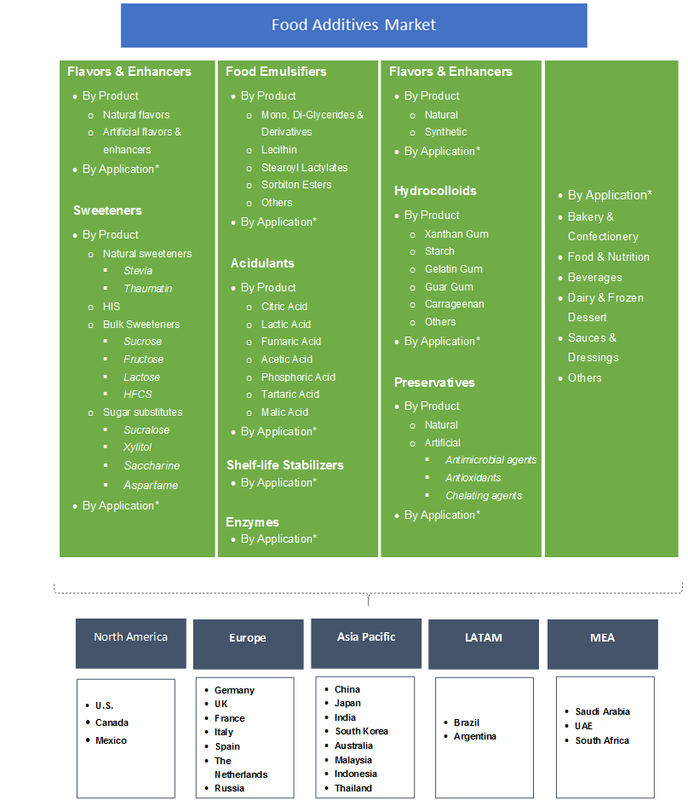 Food additives market share is competitive and moderately consolidated with major industry participants include BASF, Cargil, DuPont, Archer Daniels Midland Company, Adani Wilmer, and Ajinomoto which cater to domestic and international market. Manufacturing companies are focusing in expanding business across regions and developing strategies to size up production capability and strengthen global presence. Companies are also forming partnerships and acquire with local & regional companies to open new market opportunities, and further accelerate food additives market demand. Food additives are used as antioxidants, anti-foaming, gelling, glazing & bulking agents, emulsifiers, flavor enhancers, stabilizers, thickeners, sweeteners, and humectants in various types of processed beverages. They are mostly used in bakery & confectionery, nutritional products, meat, dairy and frozen desserts, sauces, and dressings, amongst others. Increasing packaged eatable demand for products including ready-to-eat convenient goods, ready-to-eat meals, cake mixes, snacks and frozen meals owing to rise in disposable income and change in lifestyle will stimulate food additives market size.